As demonetisation enters 50th day, the Centre is trying hard to impress upon the public that the currency ban has not derailed the economy. India's economy is mainly agrarian, and the currency ban occurred at a time when farmers were gearing up for sowing rabi crops. According to claims made by the government, the acreage under rabi crops has increased by 7 per cent in the last one week. 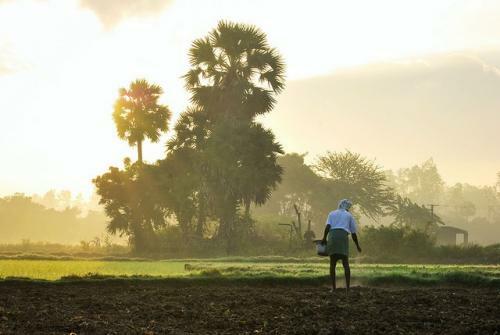 Recently, Finance Minister Arun Jaitley announced that the overall crop sowing in the rabi season was up 6.3 per cent compared with last year. Earlier, on December 2, the Union Ministry of Agriculture and Farmers' Welfare assured the country that no impact was visible on the ground, especially regarding the sowing of rabi crops. But Down To Earth analysis shows that the claim was a lie to mislead the public. What the ministry did to support its claim was to compare the sowing in the current rabi season after a good monsoon with the previous year’s sowing, following a severe drought. The sowing pace is, therefore, obviously better this year. The current sowing trend, which is at its fag end, is poorer when compared to the rabi-sowing season of 2013-14 after the last normal monsoon. That year India reported the highest production of foodgrains since Independence. Since then, grain production has declined due to consecutive deficient monsoon, causing severe drought. Experts think this is where demonetisation is going to wash away the benefits of a normal monsoon after three years. The cash ban happened at a time when farmers were in the middle of selling the kharif produce and preparing for the rabi sowing. The acreage has sharply reduced when compared to normal monsoon years. “The sowing of rabi crops as on November 18 was 11.5 per cent lower than the average of the past five years. We should not compare the area sown this year with last year’s as the residual moisture is much better than last year due to good monsoon in most parts of the country,” says Siraj Hussain, former secretary, Union Ministry of Agriculture and Farmers' Welfare. The current year is also important from the point of India’s food security. The rabi season is primarily known for wheat and pulses. This season has been seeing extreme weather for the past three years. This has reduced the production of both these crops. The shortage of pulses, in turn, has shot up the retail prices. This attracted farmers to grow more pulse crops in the kharif season, resulting in record sowing and production. The acreage of pulses shot up by more than 30 per cent. The country was set to have another season of record pulses production but demonetaisation came as a dampener. In the rabi season, the acreage of pulses has reduced. In case of gram, it has decreased by about 10 per cent in comparison to a normal year. Agriculture scientist M S Swaminathan thinks that the timing of demonetisation is proving worse for farmers. It has created difficulties in getting credit for seeds, fertilisers and energy for rabi crops. State governments should immediately prepare a demonetisation management package for agriculture and streamline credit access and delivery mechanism, he says. On December 7, the RBI lowered its gross domestic product forecast for 2016-17 from 7.6 per cent to 7.1. The reason, probably, is the slowdown expected in agriculture in the coming months.